It's inevitable. You finally get a chance to enjoy a breakfast outside of your own kitchen and then a paralysis takes over your brain's breakfast search function. All you can come up with is Keke's or Chick-fil-A breakfast biscuits (no shade), and you waste thirty-minutes of searching the internet just to find the most important of foods. Breakfast foods. To the naked eye it may seem that Orlando is lacking in independent breakfast hubs or diners, which is partly true, but you must take a deeper dive into many restaurants menus to find some bacon-laced gems. Clearly this is not a full recap of breakfast spots around the Orlando area and beyond (because I visit all restaurants and pay for my food that would take quite awhile), but rather these are some spots I consider on my go-to list when I have time to enjoy a leisurely breakfast. I often forget that Swine & Sons offers an all day breakfast menu as well as a larger breakfast offering on the weekend. Any day of the week you can enjoy their Chilaquiles (tomatillo-braised corn tortillas + pulled pig + queso blanco +fried egg + pickled red onion +cilantro) or their generous portion of avocado toast (house-made bacon + soft-boiled lake meadow egg + tomato relish + arugula + grilled millet bread). To complete your meal, don't forget they have a coffee menu! It's a full one stop breakfast here! Top competitor for my favorite restaurant in Orlando, The Strand also offers a brunch menu, but only on Saturday from 11 am - 3 pm. There you will find breakfast sandwiches, avocado toast, and my favorite corn pancakes with blueberry compote + powdered sugar + lime butter + maple syrup. Also, if you order a coffee you get your own french press which beyond being adorable makes for easy refills. If it's crowded and all the tables are full, grab a seat at the bar. During my first trip to City Diner I sat back in awe while Chef Jeremiah handled the entire kitchen line on his own while table after table of locals came in for a mid-week breakfast. The pancakes here are some of the best I've had at a local diner. I say that because pretty much anyone can make a half decent pancake, but the consistency of this batter was on another level. Thick, fluffy, rich, it was almost like an actual stack of mini cakes, not limp, airy, thin pancakes some places serve up. This place is the real deal. A definite Ron and Leslie joint for sure. 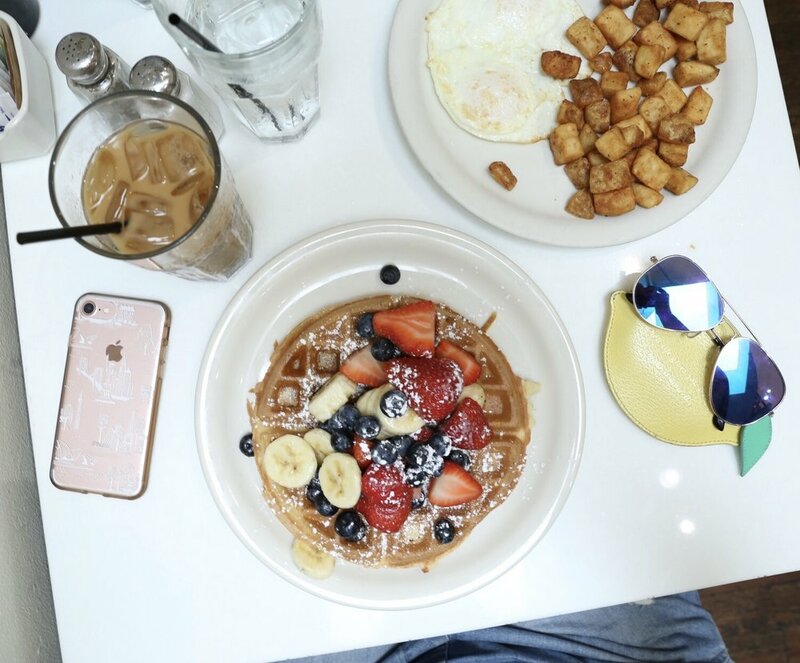 Farm and Haus has really come into their own as a trusted spot to get a delicious, fresh and filling breakfast without a long wait. While the raves never stop for their avocado toast, my new favorite is their Southwest Hash Bowl (eggs, Hausmade chorizo + roasted sweet potato + black beans + pickled red onion + queso fresco + avocado with a side of chipotle sauce). Sometimes seating in the courtyard can be spotty if it's a busy weekend, but their food travels well to take elsewhere. The Briarpatch is a Winter Park staple that only gets more popular over time, making the weekend breakfast line border on insufferable. However, if you do go during a non-peak time you can get right in and enjoy their popular pancakes or french toast, among many other dishes. This isn't exactly going to be a cheap breakfast, but they get bonus points because they are making items from scratch early in the morning, plus they serve La Colombe coffee. Seasonal toasts are always on the menu to enjoy all day at New General, but they recently started offering waffles on Sunday and I'm here for that. Orlando needs more waffles! We know how to prioritize the important things in life. Waffles, friends, then work. They have a selection, both sweet and savory to enjoy with a latte or matcha tea. After you've taken a quick picture of course. Breakfast tacos?! YASSSS! You can get your tamale fix for breakfast from 7 AM - 11 AM with items like a breakfast burrito, huevos rancheros, a tamale scramble, and the breakfast tacos below that come with scrambled eggs + chorizo + cheese + green tomatillo sauce. If you are in Altamonte this is a great grab and go breakfast option. If you don't live in College Park or work at the Florida Hospital at Rollins, you may not even know Cindy's Cafe exists. It's a small family owned business specializing in Cuban cusine and you can get a simple and affordable breakfast complete with Cuban bread and a cortadito. Newer to the Mills 50 district is Brooklyn Coffee, owned by a very kind family. I don't see it getting a lot of love on the "gram", so I'm not sure if people are aware of how good it is. Excellent coffee and a small but flavorful breakfast menu that includes the shakshuka and avocado toast seen below. If you haven't given them a chance for a simple breakfast I would add them to the list. Yes, more avocado toast! The Sanctum does have other breakfast offerings, including a huge breakfast burrito and some great muesli, but I'm partial to the avocado toast because I love to pay top dollar for things I can make at home. Classic millenial. Although I rarely make it this good. Whatever you order make sure to pair it with a tumeric or lavender latte. A croissant on it's own can count as a quick breakfast, but I personally love seeing what new items will show up on the weekend brunch menu at Buttermilk. Like seasonal grits, quiches, pancakes, and even shakshuka! If you go later in the day you aren't guaranteed the pastry counter will be full, but don't ever pass on trying something on the brunch menu. Also, don't be taken aback by seeing ingredients you aren't familiar with or pairings you question. Buttermilk is always holding it down, not matter what concoctions they come up with. The menu is always changing, so the best way to know what is being served is to follow their Instagram. I now tell friends, if they want me to take them to Se7enbites and they have other things to accomplish that day, they better split their dish or they will be in a carb coma for the rest of the day. They serve breakfast dishes everyday, but there are always more options on the weekends like their monstrous french toast stacks with eggs and bacon, but go knowing you may wait in line. Rest assured it will always be worth it. If you go before 11 A.M. a small breakfast menu of lite bites is available like pastelitos, croquettes, and empanadas. If you have time to sit down as opposed to grab n' go I would recommend their version of avocado toast. Served on Cuban bread with quail eggs and tomato, it's a great option paired with a cafe con leche. College Park residents know it as their quaint neighborhood diner, but people that live outside the 32804 zip code should familiarize themselves with Christo's as a breakfast option. There is nothing trendy or instagrammable about it, but that doesn't stop every last table from being full during the busy weekend breakfast rush. This would definitely be Leslie and Ron's hangout if they served waffles (I really wish they would add them to the large menu), but they have a variety of breakfast options that are always solid and always served quickly. If you are going to eat at a chain for breakfast, First Watch is based in Florida and still feels somewhat local. Besides, their pumpkin pancakes are so good they make me cry. Nuff said. Honorable mention also goes to Artisan's Table, who also have a great breakfast menu, but I had no photos to share, so go try and see for yourself. All photos are mine, and food was PAID FOR by me. Support your local businesses and stop DM'ing them for free food.